Listen up – this is going to be the best career advice you’ll ever get. If not – You damn well should be. Deep domain expertise is essential to really thrive in your working environment – especially in our modern society. The world is speeding up faster and faster; We have an unseen rate of technological improvements, a demographic explosion, declining fossil fuels, an economic shift to Asia and so-on. Basically; the world is getting more and more competitive by the day and you don’t want to be left behind, right? You want to be prepared for what’s coming. Ever since the paleolithic era we’ve been fighting over scarce resources. Whether this was food, shelter or trendy sabretooth skirts. Times have changed – but the essence remains the same; it’s resources we’re after. In the old days, we used to have a trading system where hunters would trade their catch with fishers for example. This is an equal exchange of value of differently skilled people. You pay money to the plumber so you don’t have to manually declog your own sink. This system allows us to tap into the expertise of others. The more difficult the task, the more money they get. Anyone can sell shoes, anyone can run behind a dumpster truck, anyone can sell fast-food. But not everyone knows how to build a house, lay electrical wiring or perform an open-heart-surgery. The more difficult and in-demand your skills are – the higher your pay-grade will rise. If you want more income – You have to deserve it first. By building up difficult skills that are high in demand based on your strengths. Strengths are the things we naturally excel at – the things that come “naturally” to us. How Do I Find My Strengths? The best way I’ve found to do this is by keeping a journal of my life in which I’m able to spot different trends. Over time you’ll be able to hone down on what you’re really good at. In what did I grow up around? Competence can arise from early practice, what types of activities were you involved in as a child? What do strangers compliment me on? You/your direct surroundings often notice your natural strengths faster than you do. Just ask around. What did I want to become as a child? What were the underlying trends? What have I been doing the last 10 years? Competence comes from doing a certain thing for a long period of time. What can I effortlessly talk about without losing drive?An interesting topic is most likely something you’re highly skilled at or highly interested in. What are the things I effortlessly excel at? What activities come easy for you? In what areas do I learn quickly? Some skills are perfectly suited to our temperament and therefore we’re able to pick these up much faster than others. Who do I envy/admire? Jealousy is a nasty but beautiful emotion as it shows us what we truly want. The same goes for admiration. Furthermore, a great book that will help you find more strengths is Managing Oneself by Peter F. Drucker. Do I work well with others or do I perform better alone? Do I produce results as decision maker or as an adviser? Do I perform well under stress or do I need a structured environment? Learn more about each type by simply Googling the results you’ve gotten. How can I combine my skills (based on strength) and my interests to solve a need for other people? Now go do exactly that. In our current information society it might be not enough to be simply highly skilled in only one particular field. The combination of different, highly valued skills is also often what elevates your pay-grade. Learn how to learn. Optimize your learning process. Keep track of global trends. Where is the world going and how can I prepare for this? Especially the technological boom is very prominent – stay ahead of the robots! The world is an inherently competitive place. You’ll need an edge to become indispensable & the only way to become indispensable is to excel at things others cannot do. Competence at a skill will lead to enjoying the activity more – enjoying it more means you’ll be doing it more which in turn makes you more competent. Eventually you’ll start to love it and it’ll become your “passion”. So don’t go searching for something until it “feels just right” but create it by building on strengths. Don’t waste time and energy on an endless passion-chase. Note: Strengths are solely performance indicators (not unchangeable truths). So don’t obsess about them. You can still “be whoever you want to be”, but you won’t perform optimally if you build your life on weakness. It can be stretched – just not indefinitely. I hope this advice is timely for you. There’s so much wasted time & energy (and frustration) in fields where we just don’t have a natural advantage in. And the world is simply too much of a competitive place not to use this. Why can’t I perform like colleague x? Why do I need to put in all this effort when colleague y is slacking to get the same results? Thanks for taking the time to read my post! I hope you liked it. If you think someone you know might benefit from this post be sure to share it around. If you’re having anymore thoughts or questions about this topic, feel free to share them with me in the comment section below! I suspect that you are not really excited about medicine and that it might not be what you are destined to do. If it was, you’d have no problem sticking to your schedule. Visualise, how you would feel if you became a doctor. Imagine yourself in the hospital, and then keep this image. I would also suggest praying too ask this has helped many with their drive and vision. I find it really awesome to read such an article in addicted to success …But my problem is I set goals to achieve on my study and follow up the routine but eventually it doesn’t work for more than 4-5 days …and I try another and the process goes on and on …really I want to study medicine but I can’t make my routine to stick in day to day activities…can you suggest me on this topic simon!! That’s simply the process of building up willpower. Each time we push passed our own laziness/fatigue it increases so next time we’ll be able to go 5-6 days. Next time we can go even further and can go 6-7 days. It’s a delicate balance between pushing yourself hard enough and accepting yourself for never being able to reach perfection. I suggest using smalls steps to build up one solid habit at a time and letting those compound on each other. I use a thirty day challenge calendar where I routinely try to implement new habits. I think you should give that a try! Thanks for your article Simon. It just made me to think why I am pursuing my job in which I am very weak!!! I need to find my strength. With the steps you provided above , I couldnt able to find my strength . I keep on thinking what I did best for the past 10 years . I DID NOTHING BEST. Now I am 27 . Is it possible still I can make to a new career where I am good with strength and skills? The best time to change is now. Find skills that are more suited to your strengths and practice those in your spare-time and see if you can’t combine those in an entrepreneurial ventures. I’d recommend to read “managing oneself by Peter F Drucker and re-consider the other questions as well. > What do you excel at effortlessly? Hope that helps somewhat, take care! You hit the nail on the head – you can’t be a generalist anymore. If you want a top career, you need to have at least one highly desired skill, and you need to be really, really good at it. If you are a digital marketer, you need to know how to grow traffic. If you are a UX designer, you need to know how to design websites that get top of the line conversions and engagement. A programmer would need to constantly improve his/her skillset with latest industry trends. The fun part is that mastery is its own reward. There is no greater source of joy in the world than knowing you are one of the best at someting! Thanks man, glad you liked the article! Most definitely – Expertise in different areas (being a polymath) combined with a desire to keep learning is what will get us ahead in the future. Agreed – as long as we pursue a direction suited to our strengths. I don’t believe everyone can excel at anything. 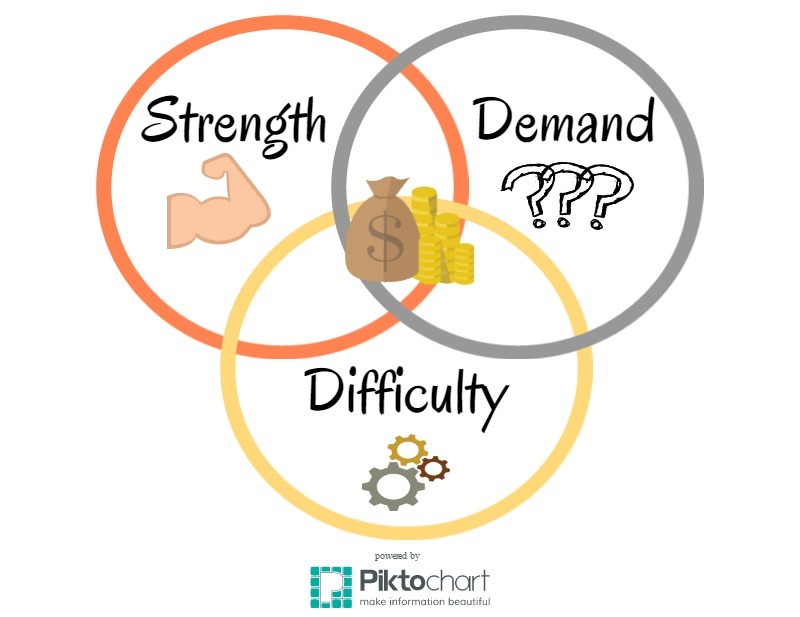 For making more money; Pick a difficult, high in-demand skill suited to your strengths and reach expertise in that asap. Well explained . I am pretty it the best career advice i ever got. Thanks Satpal, I hope it comes in time for you!